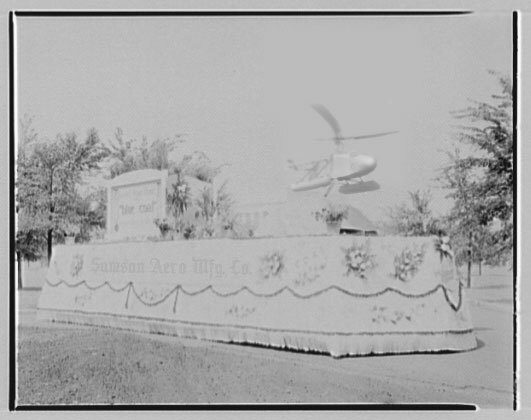 May 1940– Winning float in the 1940 Memorial Day parade, Manufacturer’s Division. The Samson Aeronautical Manufacturing Company’s entry, featuring a scale model of a “Personal Helio-copter.” Local aerospace magnate Lemuel Samson (he of the tiny homes of Samson Heights) would eventually let his obsession with this mode of transport ruin his company and deplete his fortune. It is thought that his experience riding in the model along the parade route that day was the beginning of the end for the Samson Aero. Mfg. Ltd. some fifteen years later.